The first ever 100% Biobased sun protection and self-tanning products made with 100% renewable biological material. When it comes to shielding your skin from the sun’s harmful rays, safe, natural solutions are often hard to find. That’s why TRUE created their unique line of high performance, Biobased sun essentials made in the US from 100% renewable biological ingredients. TRUE is committed to providing the healthiest skincare products, free from artificial additives and chemicals. The 100% cruelty free sustainable beauty brand uses organic ingredients whenever possible and recycled milk containers in its packaging. 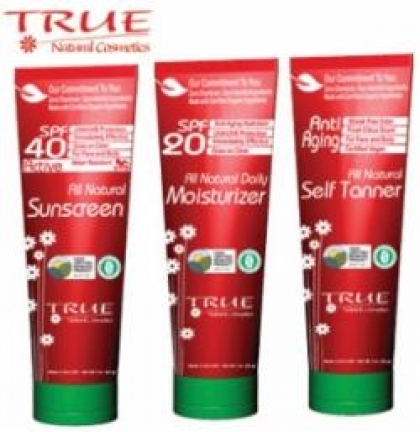 TRUE takes pride in producing products that meet the USDA’s new standard for natural products—Certified Biobased. This means the main ingredients are renewable plant or animal materials – inline with TRUE’s commitment to Zero Chemicals, Zero Harmful Ingredients. While a product need only contain 25% Biobased ingredients to garner USDA BioPreferred Certification, TRUE Natural contain 100% Biobased ingredients. The BioPreferred program strives to increase usage of renewable and local materials, promoting US agricultural businesses and encouraging cosmetics manufacturers to formulate their products with safer ingredients. Biobased TRUE sun care products are powered by pure organic plant oils and flower extracts and the star ingredient, Cupuacu Butter. Softer and creamier than Cocoa Butter, Cupuacu Butter is packed with nourishing essential fatty acids. Studies suggest Cupuacu Butter may also offer broad spectrum protection from damaging UVA and UVB rays. All Natural Sun Screen SPF 40 ($18): This high-performance, all natural sunscreen provides the ultimate in safe, long-lasting face and body sun protection for the whole family for an active lifestyle. Made with ultra-moisturizing Organic Aloe Vera, Organic Cupuacu Butter, Organic Coconut Oil, and zinc oxide, this gentle, water resistant blend provides an instant, invisible shield against damaging UVA and UVB rays for face & body. All Natural Daily Moisturizer SPF 20 ($18): Get intensive daily moisture backed by safe sun protection in one with this organic, all-natural skin saver. Featuring anti-aging ingredients such as Organic Cupuacu Butter, this multi-tasking moisturizer keeps skin hydrated and firm for everyday wear for face. All Natural Self Tan Lotion ($18): Create a radiant, natural looking glow in under three hours with this wholesome self-tanner for face and body. Packed with Organic Cupuacu Butter, Organic Green Tea Extract and Organic Aloe Vera for firming hydration, this safe, gentle formula imparts a streak-free, sun-kissed look without UV exposure. The refreshing, citrus-scented lotion goes on smoothly and absorbs very quickly. Always top with TRUE Natural All Natural Daily Moisturizer or Sun Screen to protect your glow. Certified Vegan by the AVA. The TRUE mission is to provide you with the purest, chemical free skin care products that are safe for both you and the environment. Our products are produced in the United States in a USDA National Organic Program certified facility. All TRUE products are formulated using 100% natural & renewable ingredients that are certified organic where-ever possible. All TRUE packaging contains recycled plastics and is recyclable. 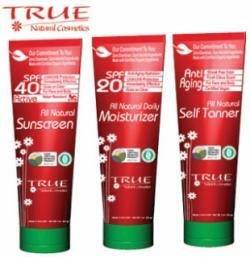 TRUE will debut its new line of sunscreens in May 2011. For more information on TRUE Natural, please visit TrueNatural.com or call 1.877.515.TRUE.